BELIZE CITY–The Isidoro Beaton Stadium had its biggest crowd in years on Saturday night, January 17, for game 2 of the finals series between defending champions Belmopan Bandits and sub-champions Police United for the Premier League of Belize (PLB) 2014-2015 Opening Season Championship. And the status quo remained at the final whistle, with the Bandits coming away with a big 4-nil victory and the championship, their 3rd consecutive win in the PLB tournaments. 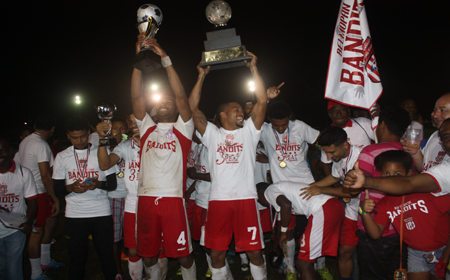 The Bandits were back-to-back champions in both the 2013-2014 Opening and Closing seasons, earning a berth to the CONCACAF Champions League, which they could not utilize because the FFB field failed to meet the required standards. In the 2013-2014 Closing Season finals, it was the Bandits over Police, 3-0 and 1-0; and in game one of the 2014-2015 Opening Season finals, the Bandits had drawn 0-0 with Police. And as it turned out on Saturday night, after beating the Bandits twice in regular season and once in the playoffs this season, Police United was still unable to get a goal against the Bandits in finals play, falling 4-0 this time, to the disappointment of their many fans. In a very competitive first half, Bandits took the lead through a penalty converted by goalkeeper Woodrow West at the 21stt minute, after Bandits forward Evan Mariano had been tackled from behind by Police sweeper Frank Lopez, and referee Irfan Basdemir made the call. But when the Bandits brought in their 18 year old midfield wonder Jordy Polanco in second half, it was all Bandits the rest of the way, as their midfield tandem of Casey and Polanco was too much the Police defence. Bandits added 3 more goals in second half, from Elroy “Bibbs” Kuylen (67’), Jordy Polanco (73’) and Denmark Casey, Jr. (81’), for the final 4-nil score and the championship. After the match, PLB officials were on hand to distribute the regular season individual awards and the champion and sub-champion team trophies and individual medals. Individual players and technical staff of the champions received Gold medals; while those for the sub-champions received Silver medals. Individual awards went to: Best Defence – Dalton Eiley (Belmopan Bandits FC); Best Midfielder – Jordy Polanco (Belmopan Bandits FC); MVP – Shamir Pacheco (Verdes FC); Best Goalkeeper – Tevin Gamboa (Belize Defence Force FC); Most Goals – Harrison “Cafu” Roches (Police United FC); and Best Management – Verdes FC. 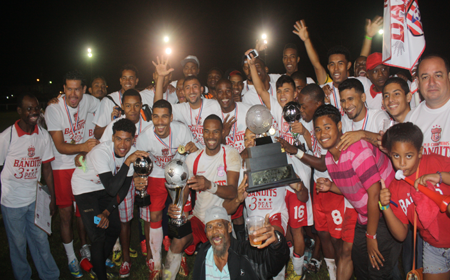 The next PLB season, the 2014-2015 Closing Season is set to commence on Saturday, January 31.